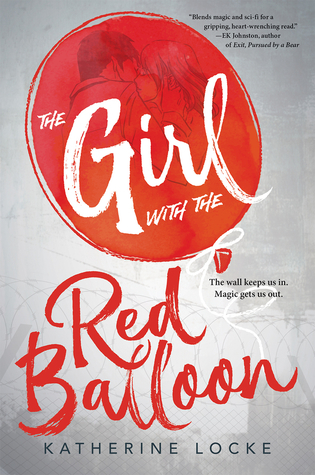 Review: I read The Girl with the Red Balloon two days ago and I am still suffering from a major book hangover. Katherine Locke has written a book dealing with a dark part of our history it was raw, gritty and a definite conversation starter, especially with everything that is going on right now. The book had three points of views one from Ellie a Jewish American girl from our time, another was Kai a dark skinned Romani boy and an unexpected point of view from Benno a Jewish boy through whose eyes we see what it was like living in the Chelmno concentration camp and Łódź Ghetto. Even though I loved all three points of views Benno is the one who wrecked me, I mean how could it not, Locke did not shy away from any of the details, she didn't sugar coat anything for the readers and she brought us into his world and made us feel his suffering in the most necessary of ways possible. If anything pick up this book for Benno. Kai and Ellie were such wonderful characters Ellie was strong and fragile and everything a girl would be who suddenly found herself in 1988 East Berlin. It took me a few chapters to really fall in love with Ellie but once she was thrust back in time her character had a lot of growth. Kai was just amazing he fled his home to protect his sister from people who were trying to harm her because of her magic, I loved everything about him once I got to really know him and yes there is romance and it was swoon-worthy as it can get. The romance between Kai and Ellie was beautiful and bittersweet and my heart is still trying to recover. There is one character, in particular, I had to mention who did not have a point of view but I loved her just as much and that would be Mitzi, a blue haired gay girl who was kicked out of her home by her family because of who she chooses to love. Mitzi ran balloons for the balloon makers along with Kai helping people get across the wall. At first, I didn't know what to think of her, was she going to be jealous of Kai and Ellie's growing relationship since before her it was just Kai and her, was she ever going to warm up to Ellie? Am I going to dislike her because of all of that? Luckily all my concerns were laid to rest when Mitzi embraced Ellie as a dear friend of her own. I loved everything about Mitzi, she was loyal to Kai and Ellie and the three of them together were the perfect trio of friends. I don't think I will ever forget Mitzi's character. This review wouldn't be complete if I don't talk about the red balloons and the people with magic running through them. There were quite a few balloon makers the ones behind the magic of balloons being able to transport people over the walls and obviously through time although the time travel portion did shock the magic community because that was never their objective which leads to the discovery that someone has their own agenda. Overall The Girl with the Red Balloon was one of the most memorable books I've read all year and it should be a must buy for everyone when it is released, I plan on buying myself a hard copy so I can re-read it again and sticky tab all my favorite parts. The characters will live with me for a very long time and I can't wait to read the next book in the series, I am little sad to see it won't be a continuation of this story but rather a prequel set decades before the events in this book, nonetheless I am very excited for it.